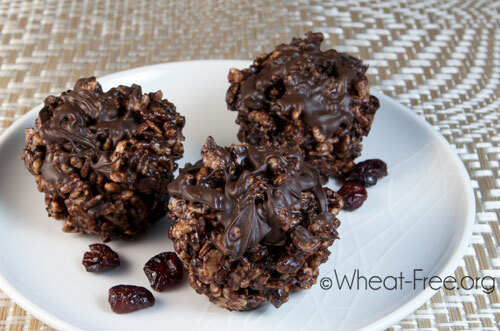 Chocolate and puffed rice, the perfect combination for a special kids treat. This is such an easy recipe that the kids will love making it, although the younger ones will need supervision for melting the ingredients. Place muffin cases into muffin tray. Put butter, honey, and cocoa powder into a large saucepan and melt over a low heat, stirring continuously. When all the ingredients have thoroughly melted and mixed together remove from heat. Add the chocolate pieces and mix until they have melted. It doesn't matter if some of the pieces of chocolate don't completely melt. Add the puffed rice and dried cranberries then mix everything together until the cereal is completely coated in the chocolate sauce. Spoon the chocolate coated cereal mixture into the muffin cases. If there is any chocolate sauce left in the saucepan spoon it over the tops of the chocolate puffs. Allow the chocolate puffs to cool and set before storing in an airtight tin. For extra special occasions sprinkle with multi-coloured sugar strands before they have set. Typical nutrition per chocolate puff (1/8): 178 calories, 8g total fat, 5g saturated fat, 0g trans fat, 25g carbohydrate, 3g fibre, 15g sugars, 3g protein, 1mg sodium, 107mg cholesterol.